Mayor Buddy Dyer yesterday issued a new proclamation endorsing a goal of powering Orlando, Florida entirely with clean and renewable energy by 2050. Mayor Dyer joins a growing coalition of Mayors for 100% Clean Energy who have similarly announced support for a goal of powering their communities with 100 percent renewable energy such as wind and solar as the community also transitions to zero emission electric transportation and safer pathways for cyclists and pedestrians. Watch as Mayor Dyer signs Sierra Club's pledge and learn about Mayor Dyer's significant accomplishments to date to transform his city in this direction. 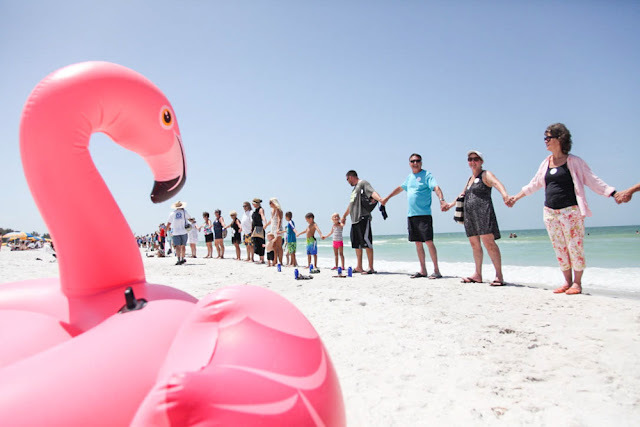 Dyer becomes the 63rd U.S. mayor and 8th Florida mayor to take Sierra Club’s pledge to commit his city to the goal of the complete elimination of all fossil fuel consumption. These mayors will gather at the U.S. Conference of Mayors in Miami Beach on June 23 to affirm their commitment. I believe that a transition to 100 percent clean energy is good for my community: It will make us stronger, healthier, and more resilient; it will create jobs and new business opportunities; and it will allow us to become a more equitable society where everyone has opportunity in a thriving local economy. Nearly 200 nations have agreed, for the first time in history, that the world must achieve 100 percent renewable energy by the end of this century. In the United States, action by local government is already a significant driver of renewable energy growth because cities know firsthand that steps to reduce carbon emissions, clean the air, strengthen the economy, and improve lives. Positive, bipartisan, community-driven solutions are possible and already happening in our community. I will continue to work with all stakeholders to transition away from dirty energy and implement local, affordable solutions like energy efficiency, solar, wind, and pollution-free electric transportation. 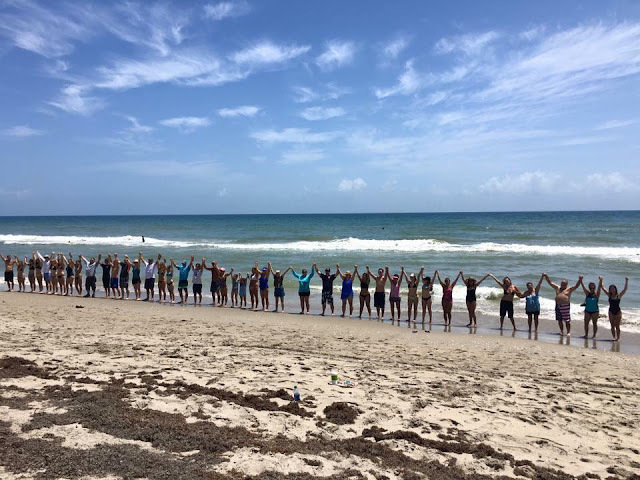 Sierra Club members joined and helped organize Hands Across the Sand events on beaches and cities across Florida on Saturday, May 20. At noon for 15 minutes, participants locked hands to say no to fossil fuels and yes to clean energy. 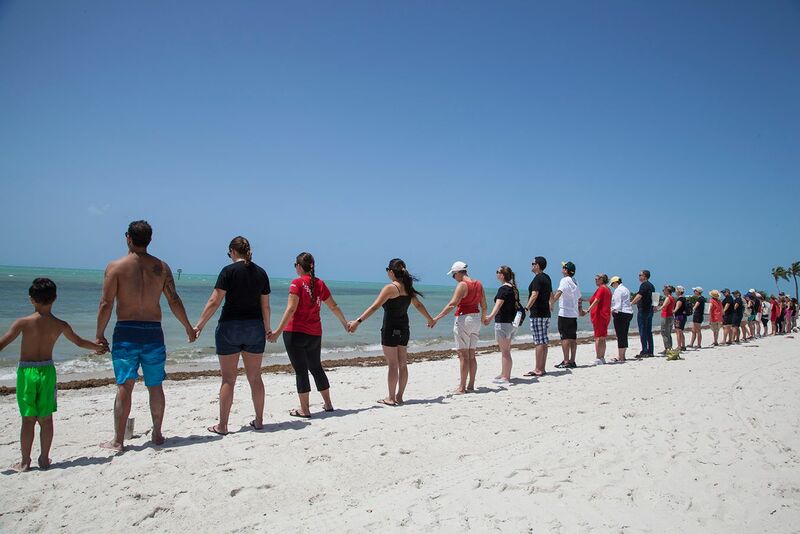 Hands Across the Sand was launched in 2010 just two months before the BP oil disaster, but this was the first since Trump announced intentions to expand drilling and seismic airgun blasting off the Arctic, Atlantic and Gulf Coasts and on public lands throughout the U.S.
Mayor Philip Levine displays proclamation with Ready for 100 activists. 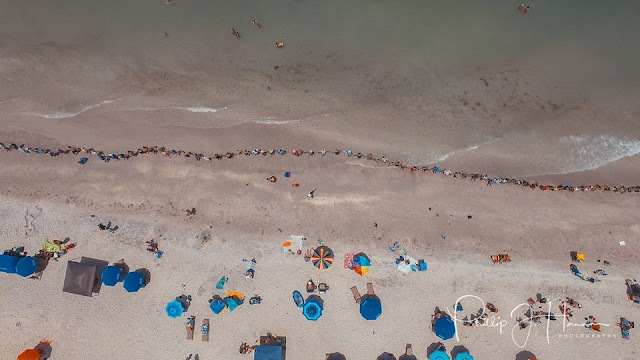 Miami Beach Mayor Philip Levine issued a proclamation last Wednesday supporting an aim to power the densely-populated barrier island entirely with clean and renewable energy. 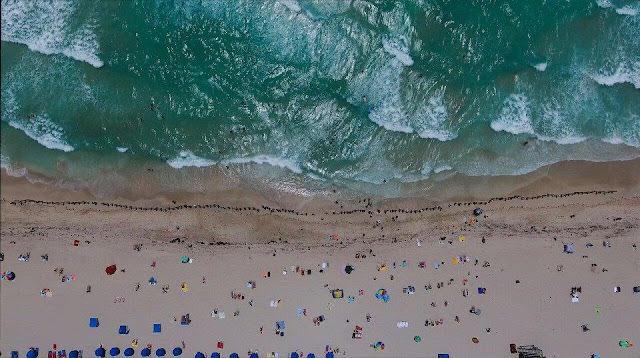 Miami Beach, known for its wide beaches and pastel-colored art-deco hotels, is one of the cities most-threatened by climate change's rising seas. 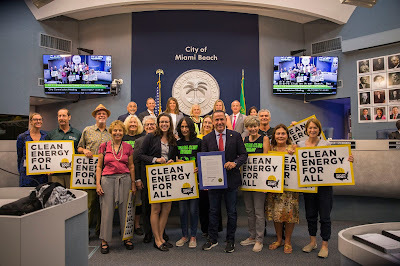 Supporting the measure at City Hall were 12 Sierra Club Miami Group members, and representatives of allies Miami Surfrider and 350 South Florida who held signs that read "Clean Energy For All." The Mayor also proclaimed Wednesday, May 17, "Sierra Club Day." Emily Gorman, representing the Sierra Club, thanked the Mayor and Commission and said clean energy presents an opportunity "not just for our pocketbooks, but for our communities and our economies." 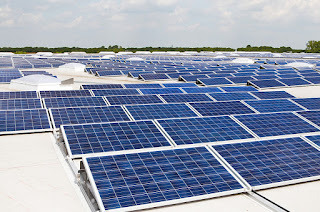 City staffers shared plans to update their Climate Action Plan, and Vice-Mayor Kristen Rosen Gonzalez introduced a measure to commit the city's municipal buildings to 100% clean and renewable energy supply by 2025. In addition, all City Commissioners voiced their support for Sierra Club and its Ready for 100 campaign to shift cities to 100 percent clean and renewable energy. “As mayor of Miami Beach, I am proud to support a vision of 100 percent clean energy for my community. Our vibrant, historic city will be a model for other communities around the world on the importance of addressing the threat of climate change. We have already taken steps to expand renewable energy and we will continue to improve our infrastructure and innovate clean energy solutions for a stronger Miami Beach,” said Mayor Levine. 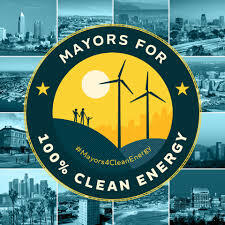 Mayor Levine is a national co-chair of the new Mayors for 100% Clean Energy, a new effort to engage and recruit mayors to endorse a goal of transitioning to 100 percent renewable energy in cities across the country. 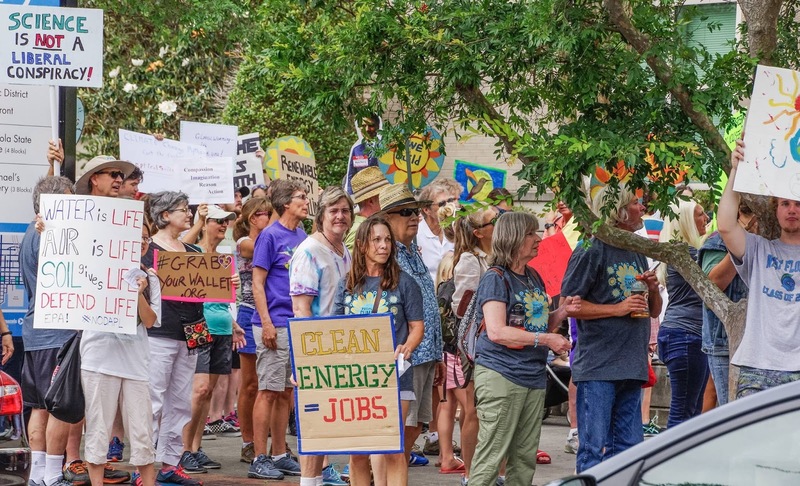 “Cities can help lead the transition away from dirty fuels to renewable energy, but it will require boldness and ambition to get it done," said Frank Jackalone, Sierra Club Florida Chapter Director. 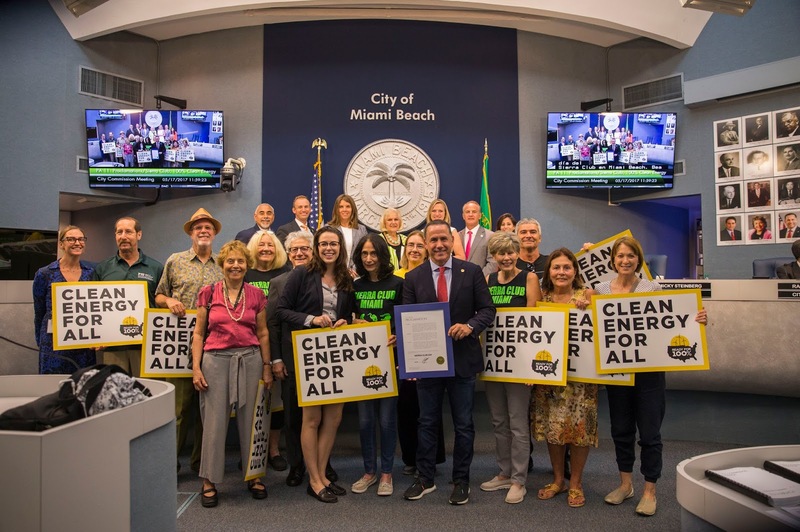 "The Sierra Club applauds Mayor Levine for supporting a vision of powering Miami Beach with 100 percent clean, renewable energy." 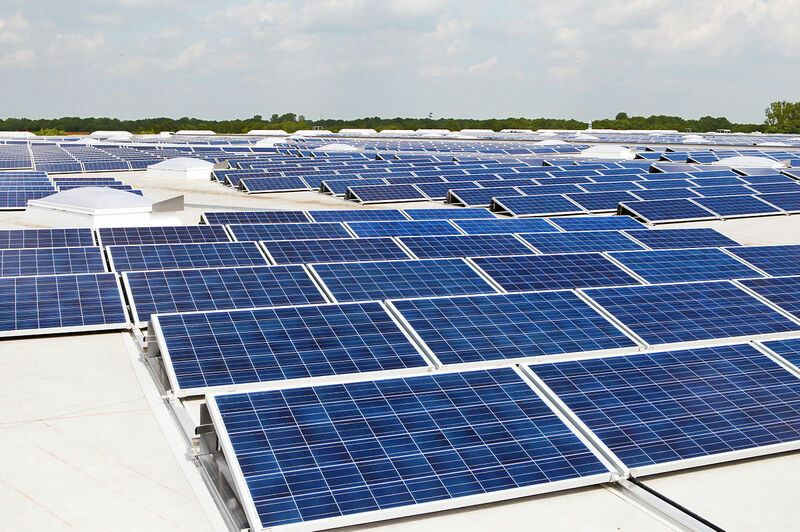 Florida created more than 1,700 new jobs in the state’s growing solar industry last year, according to a report released earlier this year by The Solar Foundation. Florida is now home to 8,260 solar jobs—an increase of 26 percent from 2015 figures. According to the Solar Foundation, the Miami metropolitan area gained 811 solar jobs from 2015 to 2016, representing a 31 percent increase. 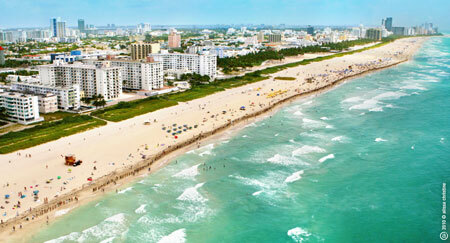 Miami Beach will host the U.S. Mayors Conference June 23-26. 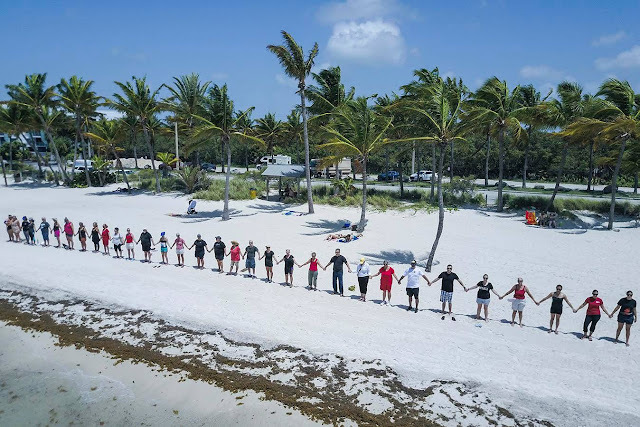 Sierra Club Ready For 100 nationwide campaign leaders will meet in Miami Beach to participate in trainings and other events that week. For the first time in years, many Floridians are suffering from high levels of unhealthy smog. Orlando is still suffering from its worst smog in years. This week, smog levels have spiked in cities like Orlando and Ft. Lauderdale. That's hazardous for people with asthma, heart disease and COPD, reaching levels unhealthy for everyone. The main source, emissions from our cars, trucks and buses' tailpipes, has been exacerbated recently by additional nitrogen oxide from fires. Today, as smog levels begin to decline in the Tampa Bay area, cities like Ft. Lauderdale and Orlando are still suffering from dangerously high levels that mean that exercise outdoors in the late afternoon is off limits for sensitive people, and not a good idea for anyone. Most Floridians have had a rough time breathing this week. Where does smog come from? Our tailpipes' nitrogen oxide and volatile organic compounds (VOC) emissions combine with Florida sunshine throughout the day to convert to ozone. Power plants burning coal and, to a lesser degree, natural gas, also contribute, but not at levels as significant as our own cars' tailpipes. Smog levels increase throughout the afternoon, peaking as people get off work and go walk the dog or jog, and then rapidly decreasing after sunset. Summer rains help wash nitrogen out the air (and into lakes and rivers! ), but in May, with our seasonal dry conditions, smog builds up. Combine that with a stagnant high pressure system and wildfires that contribute more nitrogen along with particulate, and you have what Hillsborough County EPC Air Quality staff Alain Watson today described to us as a "perfect storm" for unhealthy smog. Florida's had several days in both the Orange and Red Alert levels this week. You can't see and smell smog like you can the particulate-laden smoke from fires, so being aware of the risk is important, especially those whose asthma or other conditions make them more sensitive. Media in central and south Florida have been busy alerting the community this week. The Hillsborough Environmental Protection Commission's Air Quality office sends alerts upon request. You can get on EPC's list by calling 813-627-2600, ext. 1298. What can you do to make the air healthier for everyone to breathe? Maybe you can't fight forest fires like Smokey the Bear, but you can fight smog at its main source. This weekend, take Mom for a test drive in an Electric Vehicle, like a Nissan Leaf or Tesla, or a Plug-In Hybrid Electric Vehicle like a Chevy Volt that only uses gas on trips over 50 miles. Great deals are abundant on both new and used EVs and PHEVs that'll save you big bucks on fuel and maintenance, while eliminating your own personal smog contribution. As utilities, business and homeowners continue to add more solar power, the net amount of air pollution your EV causes from generation of electricity it runs on, already much lower than even a Prius, will continue to decline over the life of the vehicle, making your EV cleaner each year, while any car that runs on gas or diesel will remain just as dirty a source of smog as it is today. Consider joining Sierra Club staff and other members who've made the switch to a clean, quiet electric vehicle, and next weekend, Saturday May 20, drive your new EV to your local beach to Join Hands Across the Sand and say No to new offshore seismic testing and oil drilling for new sources of oil that are now completely unnecessary. Tell Donald Trump: "no thanks, we don't need any new oil rigs - we're trying to quit!" 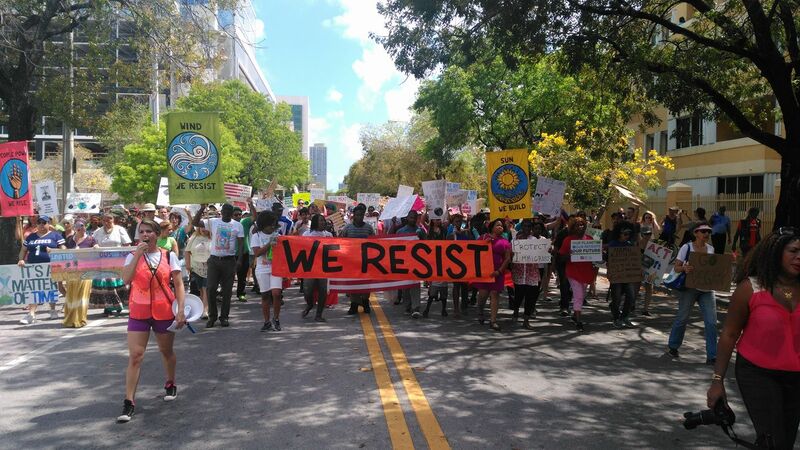 Thousands of Floridians marched, rallied and biked for climate justice last Saturday. 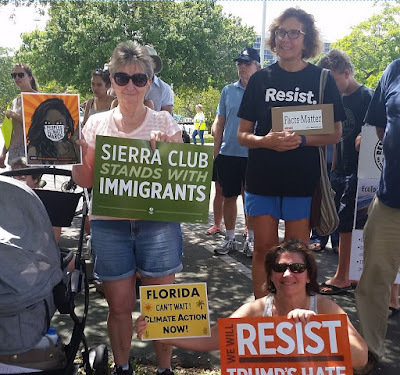 Sierra Club staff and volunteers organized, supported and participated in 22 events across the Sunshine State, including Mar-A-Lago, Trump's so-called Winter White House. The mass-mobilization was organized by many organizations. 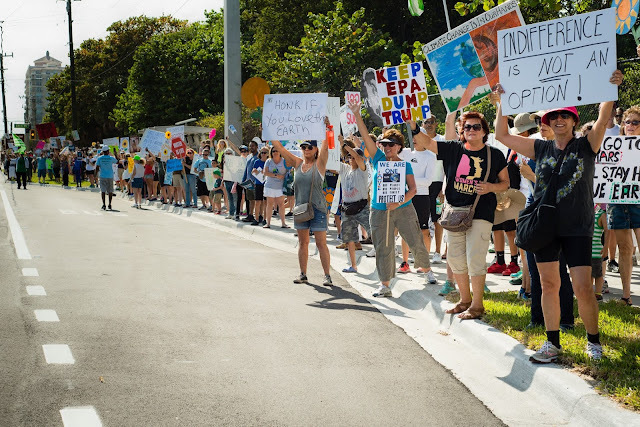 Some were led by the Sierra Club and allies like 350.org, Surfrider and Environment Florida, some by climate justice organizations like Organize Florida and the Miami Climate Alliance, some by resistance groups like Indivisible and Women's March, and some were organized by teams of groups and individuals, alike. There are too many to name. A special note of thanks to Kimberly Miller who quickly organized a great event in Jacksonville with the Sierra Club Northeast FL group. 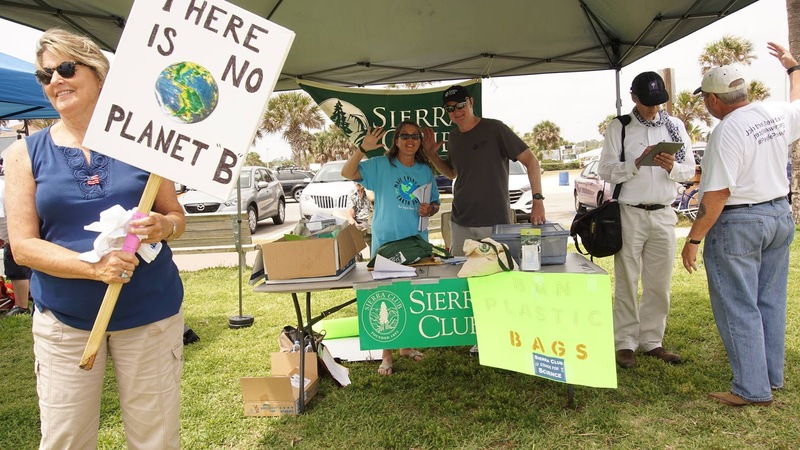 Sierra Club convened statewide weekly coordination calls for the month preceding, so staff or volunteers from a variety of organizations could compare notes, receive information and be part of a unified Florida effort. 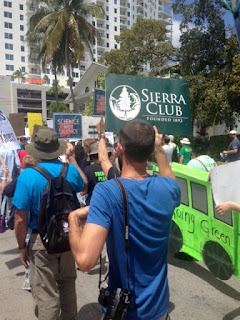 Sierra Club encouraged every major and mid-sized city to participate. 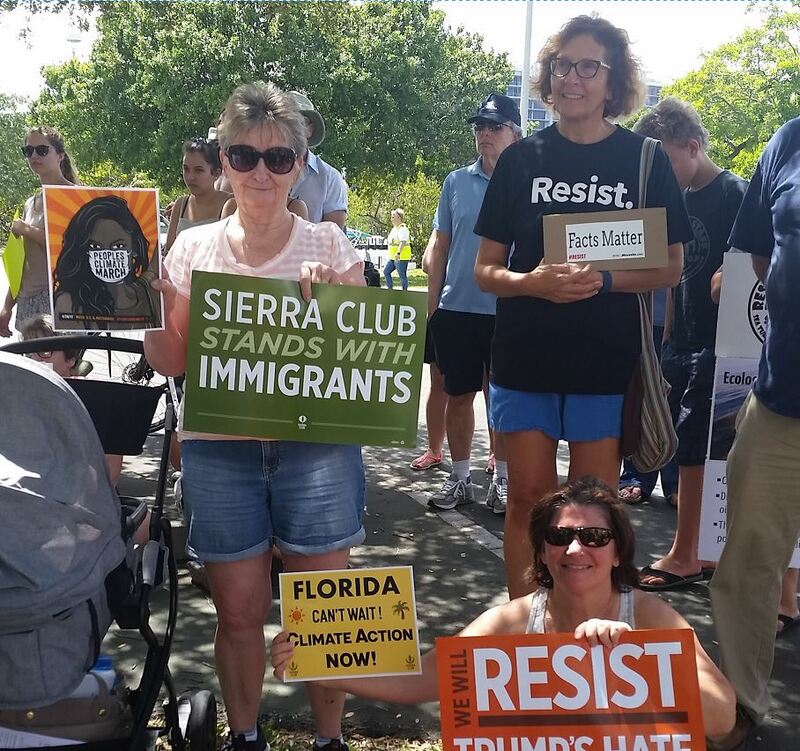 Our Florida Sierra Club volunteers and staff worked directly on individual marches and on statewide media and outreach. A crowd of around 500 gathered for the People’s Climate March on Mar-a-Lago. 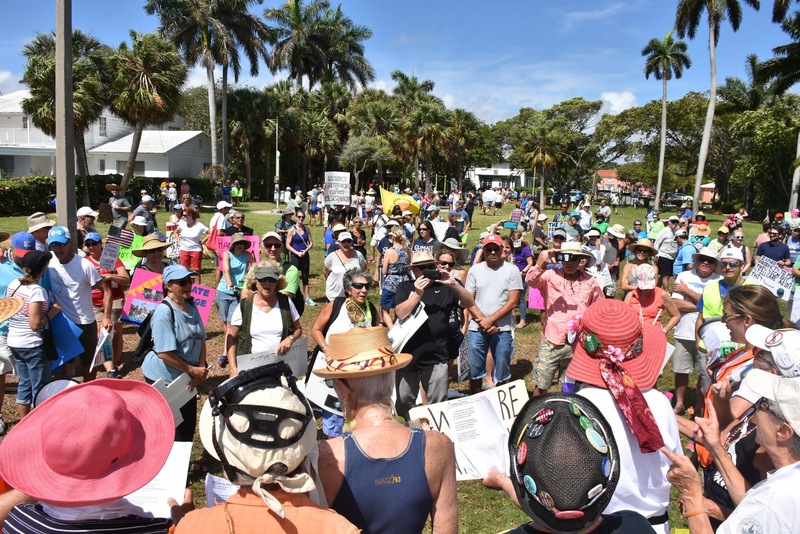 The march kicked off with a rally across the water from Mar-a-Lago at George Petty Park . 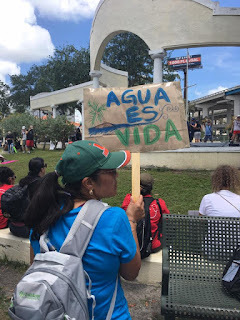 The Rally consisted of a series of speakers including: Laura Morales of the Citizens Climate Lobby, Rabbi Barry Silver on behalf of the Palm Beach County Environmental Alliance and Congregation L ' Dor Va-Dor, Alex Newell Taylor of the Florida’s Women’s March, Patrick Ferguson of Sierra Club Florida, and David Gibson of Peace, Justice, Sustainability Florida, along with musical performances by Allegra Miles and the “Raging Grannies.” Participants then marched on Trump’s "Winter Whitehouse" of Mar-a-Lago to demand climate change solutions and an end to climate change denial! 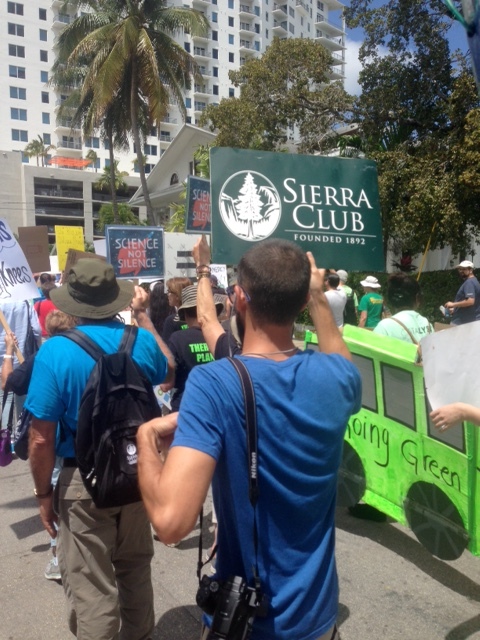 Sierra Club organizer Patrick Ferguson was a speaker at the rally and was quoted in the Palm Beach Post the next day. 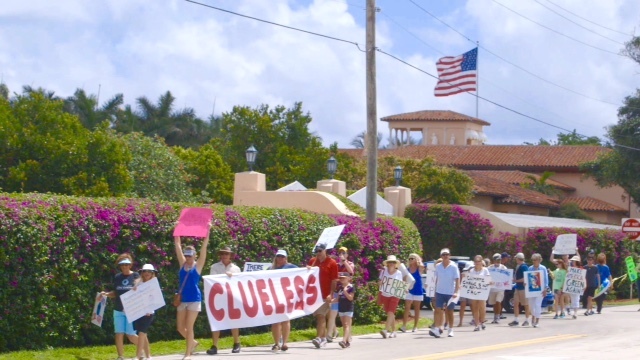 Protesters march past Mar-A-Lago (in background). Image by Derick Dublin. Hundreds gather before the march to Mar-A-Lago. Photo by Steve Hawes. In Miami, several hundred marched from Little Havana's Jose Marti Park, which experienced extensive flooding last year due to sea level rise, to the Lyric Theater in Overtown, Miami's historic African-American community. The event was organized by the Miami Climate Alliance. 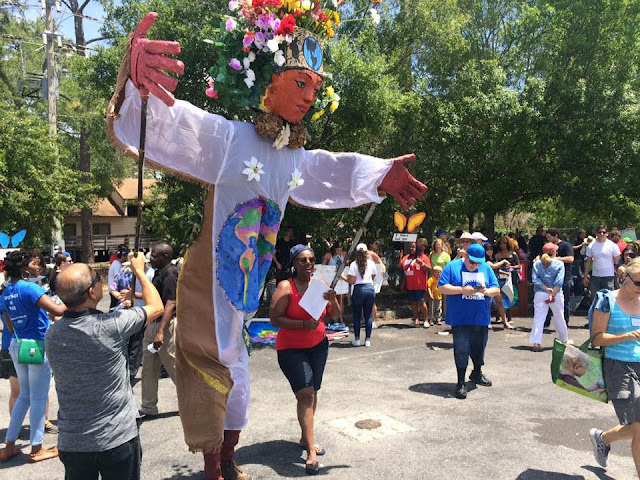 Five musical groups represented Miami's diverse communities at the event. Some of the props included a two-person operated Polar Bear and a Green Bus. 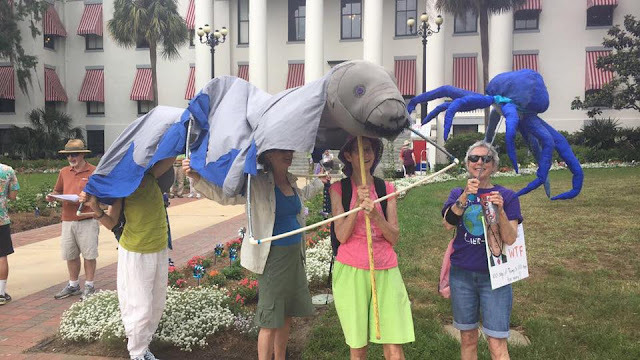 There was also a 45-foot black snake, with the words FPL and Sabal Trail on the side, representing the Florida power company's interest in a fracked gas pipeline being built through the state. 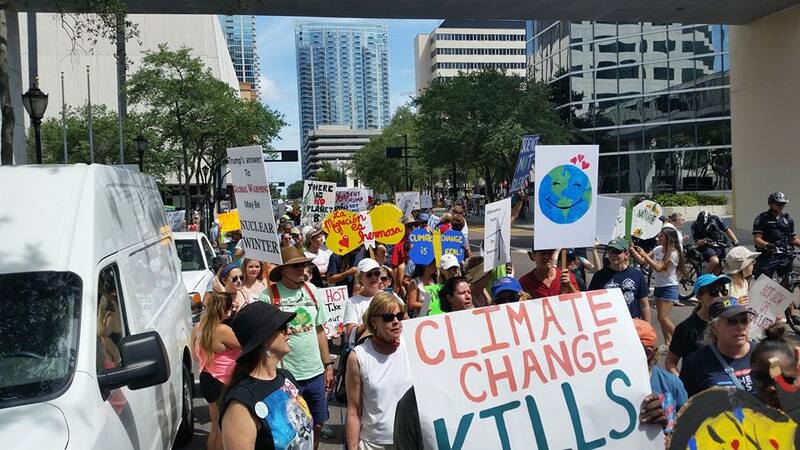 On the hottest April day on record, over 500 residents of the Tampa Bay region rallied and marched in downtown Tampa at the Tampa Bay Peoples' Climate March. 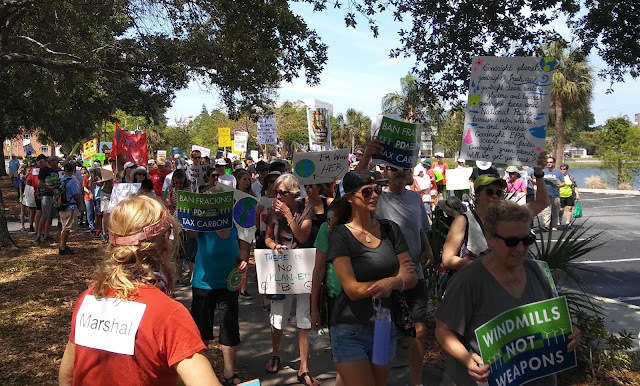 The event was organized Organize Florida and a broad coalition of local, state and national environmental and health care organizations and kicked off the Mayors for 100% Clean Energy campaign for the city. 500+ signed Sierra Club's petition asking Mayor Bob Buckhorn to join his peers in supporting a vision of 100% clean energy for Tampa's community, and over 80 wrote handwritten letters to the mayor. Sierra Club Florida Chapter Director Frank Jackalone was a speaker at the event. Nearly 600 people rallied and marched in Fort Lauderdale. 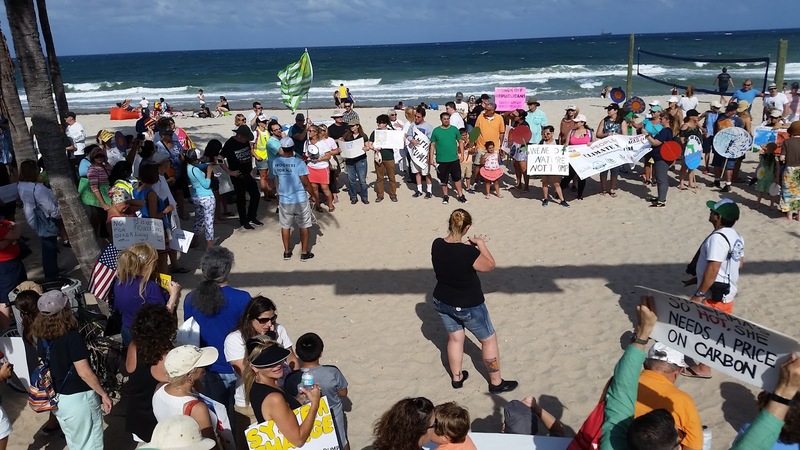 A rally was held at George English Park, followed by a march along Sunrise Blvd toward the beach on A1A that had been destroyed by Hurricane Sandy. 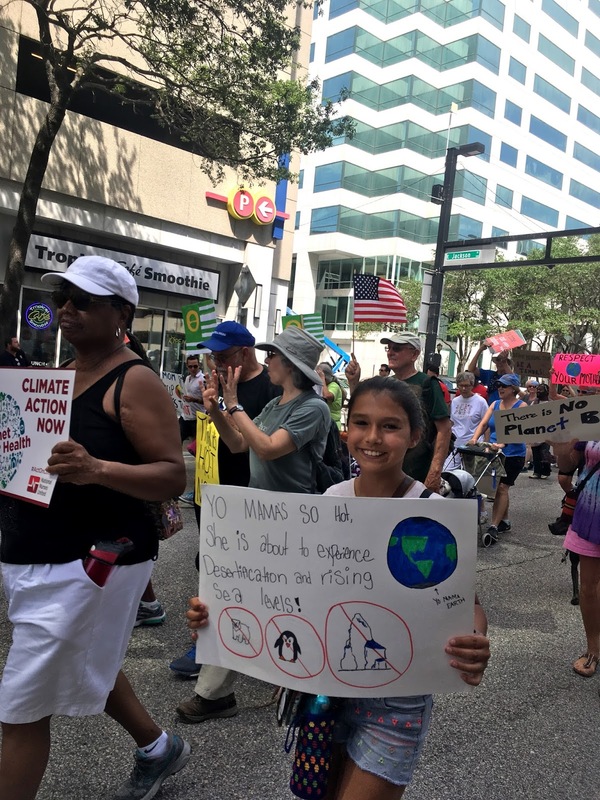 Event was led by Women’s March Florida, with support from Sierra Club and other organizations. 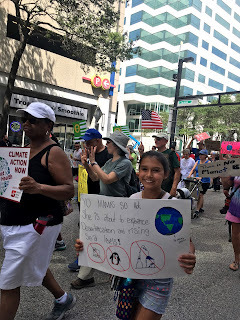 Diana Umpierre, Sierra organizer for Everglades Restoration campaign and President of International Dark-Sky Association, shared her reasons for marching and for hope. Other rally speakers included Emma Collum (Executive Director of Women’s March FL), Tim Canova (Progress for All), Louis Merlin, Rebecca Harvey (Citizens’ Climate Lobby), Kelsey Reider (climate change biologist), Dr. Keren Prize-Bolter (sea level rise expert), Richard WhiteCloud (sea turtle conservationist), Paola Espitia (marine biologist) and several panel speakers representing indigenous, black and other environmental justice communities. Protesters holding Sierra signs to resist Trump’s hate and demand climate action now. Photo by Diana Umpierre/ Sierra Club. 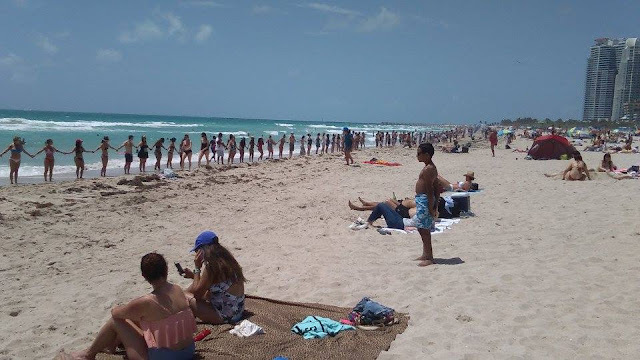 Rally at Ft Lauderdale beach, along section of AIA that had been destroyed by Hurricane Sandy. Photo by Diana Umpierre/ Sierra Club. 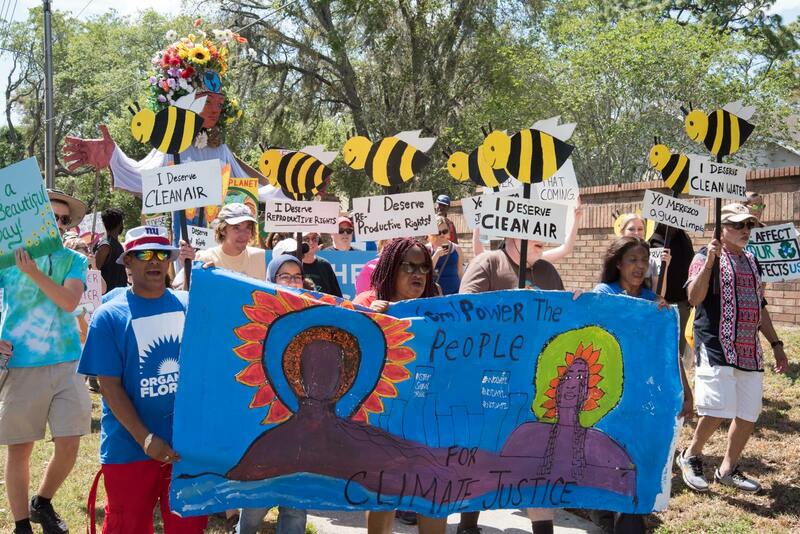 On Saturday, April 29th, Organize Florida and its allies gathered to march for jobs, justice, and climate in the Pine Hills community. The march ignited change by lifting up the voices of the Pine Hills community and those most impacted by climate change- communities of color and low-income communities. The march closed with a healing circle, and a community event that included food, performances, yoga, and activities for kids. The message is clear, climate action must be rooted in Racial, Economic, and Gender Justice. 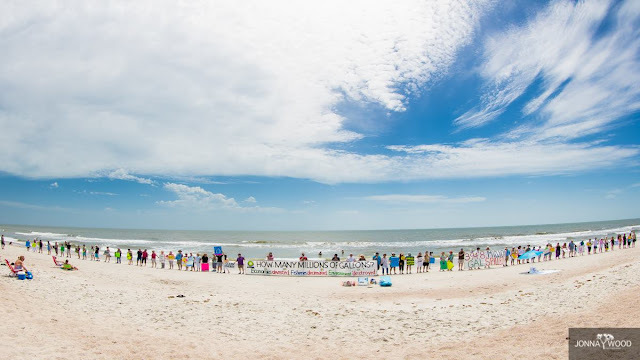 Despite heat stroke potential in the air, over 300 people participated in solidarity efforts to raise attention to the National Climate Movement. 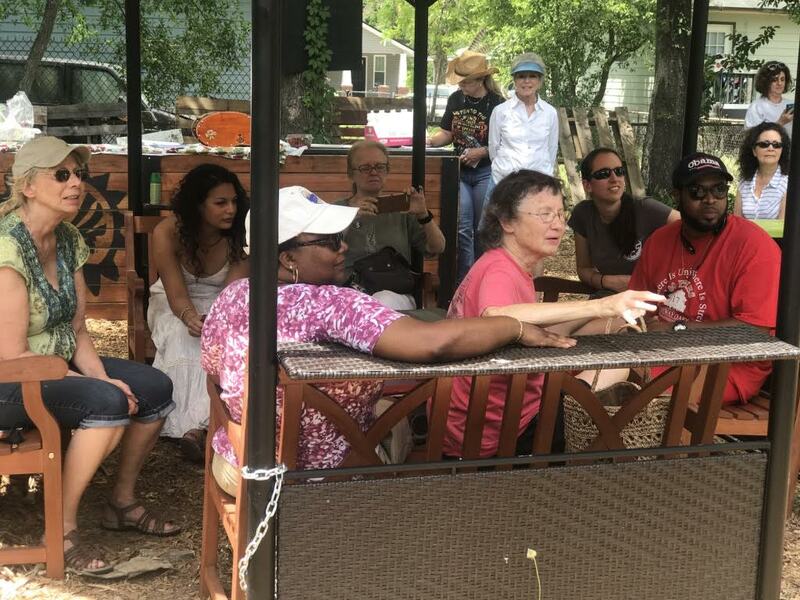 A diversified group of citizens representing health, labor, bi-partisan politics, environment and community came together for the first time to build relationships that will have a lasting purpose of alliance. They marched through searing temperatures shouting chants for justice, peace and healing in a troubled world. Shana Smith, local community builder, emceed the event with facts about our global climate crisis and songs such as "This Land is Your Land" and her own local rendition of "Paradise". Speakers included Merrillee Malwitz-Jipson a Sierra Club Organizer, Wes Wheeler of the Gainesville Solar CoOp, Mayor Lauren Poe, Alachua County Commissioner Ken Cornell and poet E. Stanley Richardson. 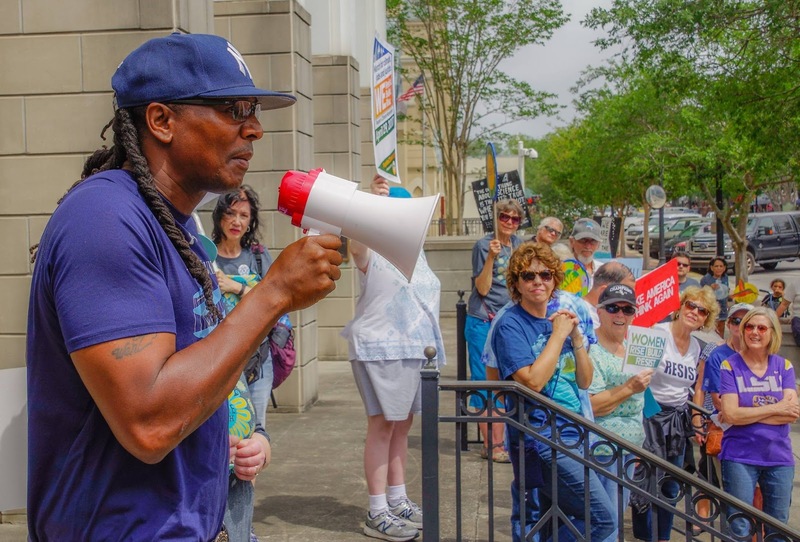 In the midst of an old southern city, more than 300 motivated souls came together in Pensacola to stand for action on climate change. We marched, chanted, sang, and danced in celebration of our living planet and the transition to clean energy. A most memorable part of the March was when dozens of marchers, from children to elders, came forward to tell their personal stories of why they marched. From children and grandchildren, to the wonders of a living planet, for justice, for the health of wildlife--there were many beautiful and powerful stories told. 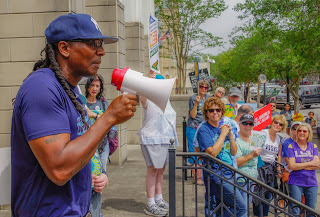 The event was organized by 350 Pensacola. Photo by Community Unlimited, Facebook. 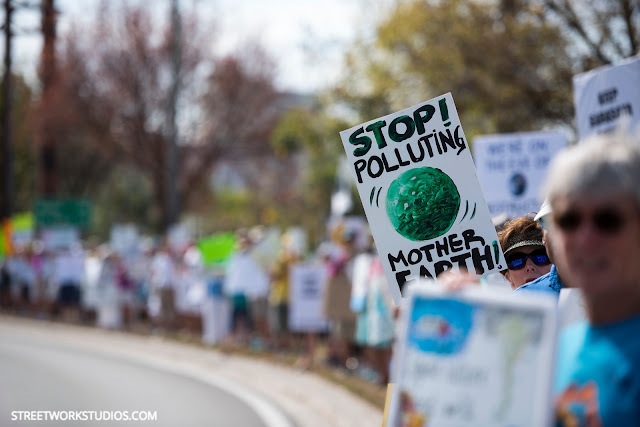 Hundreds of Sarasota County climate activists rallied along US 41 at Bayfront Park to clamor for an end to our dependence on dirty fuels and a move toward green energy on the gulf coast. The event focused on the local Ready for 100 % clean energy initiative for the City of Sarasota, where residents are preparing to take their fight to the city commission on June 5. The event was organized by the Sarasota Climate Justice Coalition. 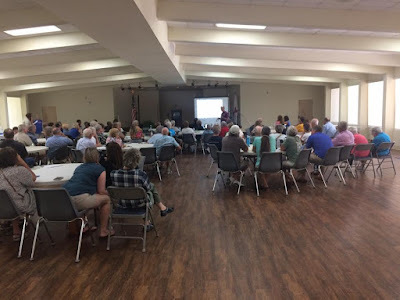 For Our Future, Sierra Club, Green Party, New Town Urban Farm and other organizations joined together to discuss local environmental injustices here in Jacksonville. We heard from Nathaniel Borden of Fairway Oaks Homeowners Association who are fighting the City of Jacksonville and Habijax for building homes on a known contaminated site. Janet Stanko and Karen Morian talked about state based legislation against fracking and sea level rise. Together, we took a stand just one week after Earth Day - and on Donald Trump’s 100th day in office - to take the first steps in building a long-term grassroots movement that will fight for bold climate action to protect our communities, city and planet. We look forward to the work we will do together. 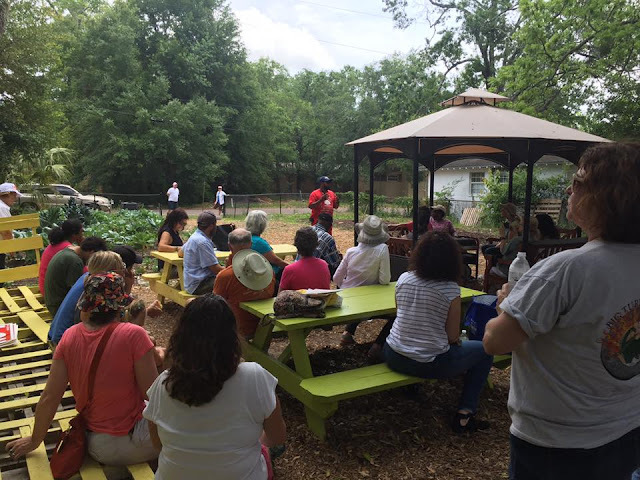 Group gathers at New Town Urban Farm in Jacksonville. Photo by Kimberly Miller. Listening to Environmental Justice activists at New Town Urban Farm. Photo by Kimberly Miller. 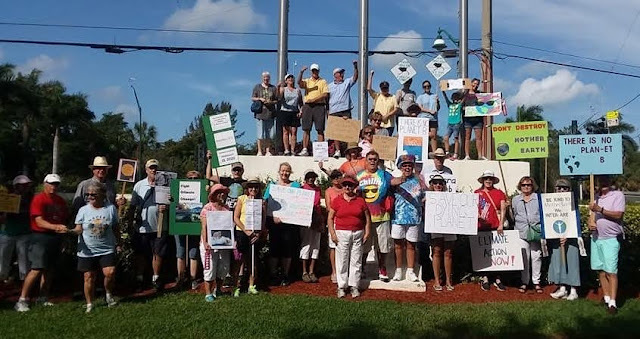 Ft. Myers residents rallied at Centennial Park and marched to the Edison Bridge and back. Organized by A.J. Amedure and Ruth Scott of the Sierra Club Calusa Group. On the steps of the Florida Capitol, more than 100 people and a dancing manatee turned out for a rally organized by Surfrider Florida and the Big Bend Group of the Sierra Club. A crowd gathers at the State Capitol. In Florida, the beloved Manatee is threatened by climate change. 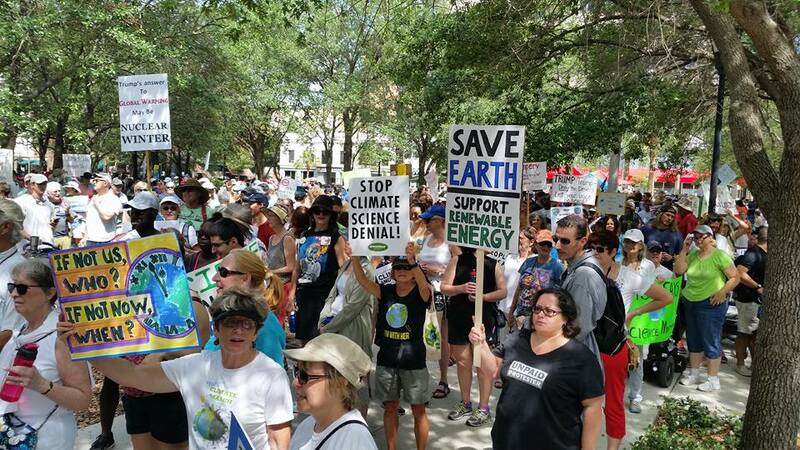 More than 100 people rallied and marched in St Petersburg in solidarity to People's Climate March in DC. Rally speakers included St. Petersburg City Council Chair Darden Rice. The "Rally by the Sea" was the sister Climate March event in Flagler Beach.The march over the Flagler bridge was attended by over 200 people, empowering their message of support . 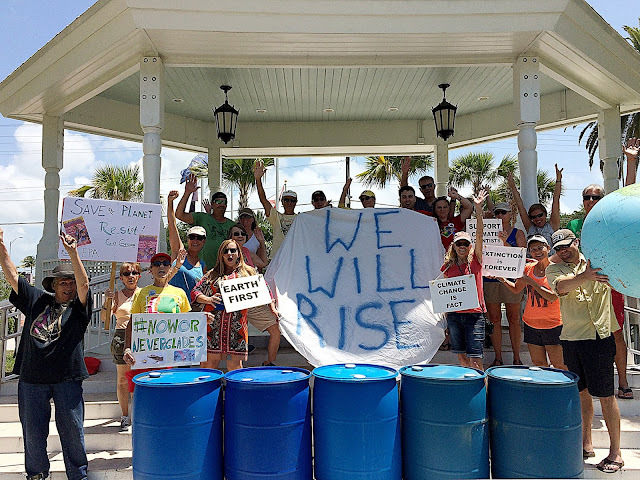 The rally continued at Veterans park with passionate speakers addressing climate change, social justice, equal rights, plastic bag pollution, and jobs. This was the first event in Flagler in many years and attendance was encouraging. 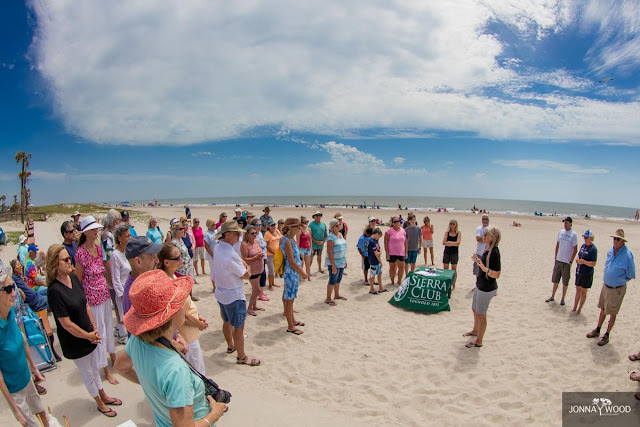 Coquina Coast Democratic Progressive Caucus and Sierra Club Volusia-Flagler Group with support from other groups and individuals. 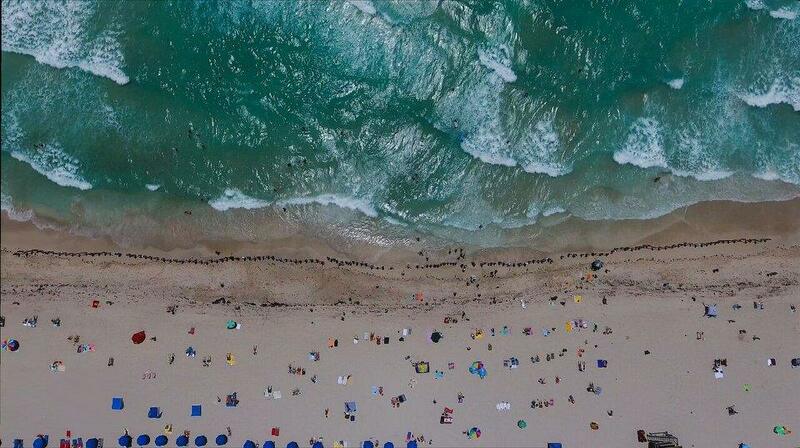 Crowd turns out on Flagler Beach. 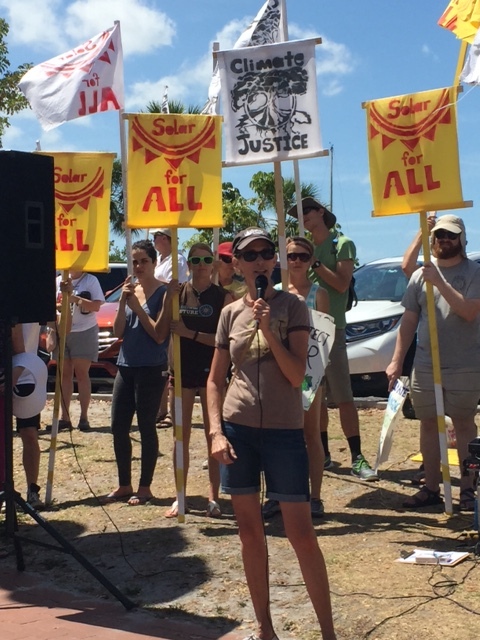 About 200 people came out to a People’s Climate event by the Collier County Government Complex in Naples, FL. They rallied and waved signs to passing motorists who were really positive to them. Event was organized by Indivisible Collier with support from other groups and concerned citizens. In Florida's Trump-friendly retirement enclave, The Villages, climate protesters organized a flash-mob. 91 people attended a rally and forum at the Sebring Civic Center. Hosted by Women's March Florida-Florida Keys Chapter and City of Key West - Preserve Island Life Campaign. Mayor Cates spoke about what the City has been doing about Climate Change. Also present: Trophia Buterfly Foundation, Monroe County Extension Service, Florida Keys Outreach Coalition and Florida Keys Aqueduct Authority. The southernmost Climate March in the U.S. In Pasco and Pinellas Counties, over 20 people participated in bike rides (Bike CD12) as part of People's Climate March. Areas involved included: Lake Tarpon, Clearwater/ Safety Harbor, Odessa, New Port Richey and Dade City. 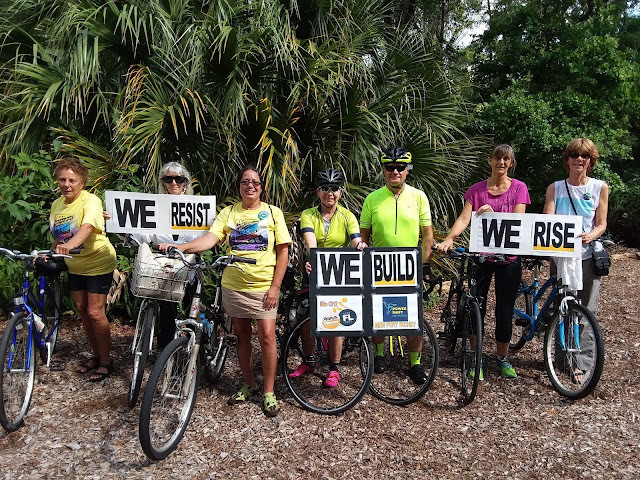 According to the lead organizer, Elize Mysels with Pasco Activists, the most valuable outcome of this effort was the new connections made, which has even led to some of them uniting to take action on some local issues.